Seaweedless Sushi - Making your own home-grown wraps from edible, easy-to-grow leaves. Sushi is an elegant and nutritious dish any time of the year but as a Summer lunch eaten outdoors with produce fresh from the garden, nothing can top it. However, it is always pleasing to me to grow as much of our daily food as possible and so I just came up with this idea from looking at the seaweed alternatives we had growing around us. Making your own seaweedless sushi doesn't mean you have to go without wrapping the rice, although this in itself can be both aesthetically pleasing as well as highly edible. 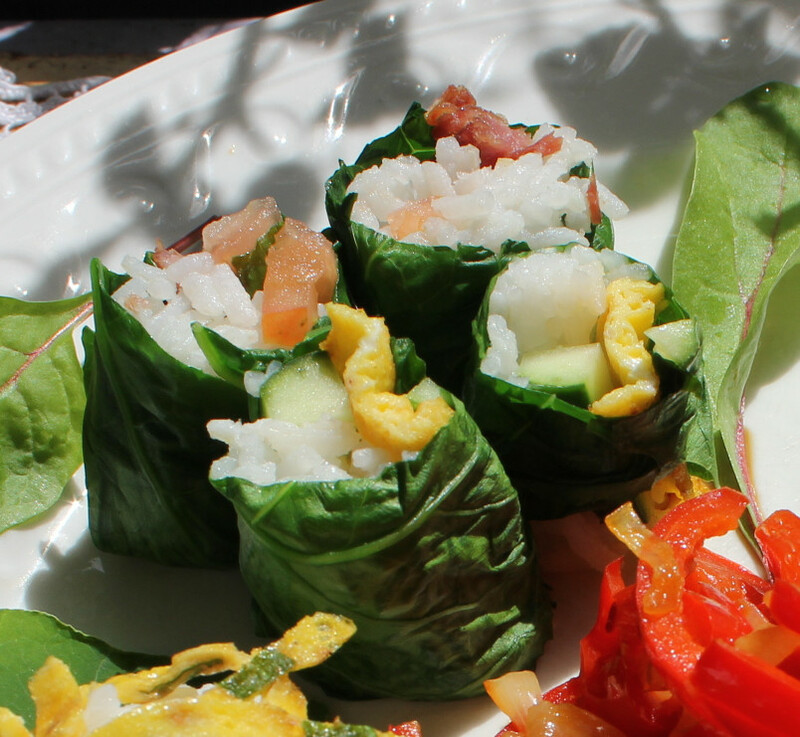 Here is a very simple light lunch created from balls of Thai rice just placed on nasturtium leaf wraps. I married them with a confits de tomates and a fines herbes omelette. Just add a little of the filling, a touch of soy sauce and then pinch the leaf up around the rice, for an easy DIY wrap! For a more elaborate traditional sushi, I wrap the rice in extra large nasturtium leaves. I don't have a rolling mat but just use eco baking paper. I can then cut them into lengths just as I would with nori. You can also use other leafy vegetables such as cabbage, kale or spinach but the younger and more pliable leaves are easier to manage. Nasturtium is a most useful plant to grow in any garden, not just for decoration or wildlife habitat but because the leaves, flowers and seeds are all edible. They will also grow in poor soil, in containers and as they can be found in both bush and climbing varieties, are eminently suitable for urban or limited space, square foot and vertical gardening. They will also grow in poor soil, in containers and as they can be found in both bush and climbing varieties, are eminently suitable for urban or limited space, aka square foot, gardening. The container-grown climbing nasturtiums, shown left, have been growing here for two years and backed by the stone wall, actually over-wintered and provided us with some welcome additional Winter salad leaves. The plant is perennial but often grown as an annual but it self-seeds freely. These plants are the 'children' of the ones we planted here in late Summer last year and ate in the Winter, all through the Spring and earlier Summer. This photo, taken in Summer this year, shows how the new crop is progressing and unless we have a heavy frost it should keep us going well into next year. All I have done is top dressed with a little home-made compost. The picture of the parent plants, below, was taken in April. In the past nasturtiums along with sprouted seeds and citrus fruit were used to treat scurvy because of their high vitamin C content, they also contain valuable anti-oxidants. Prized for centuries as a medicinal plant, the nasturtium can be used to treat skin problems, hair loss and has valuable antibiotic qualities. My particular favourite is 'Jewel of Africa', which is a climber or scrambler with variegated leaves. The flowers come in many different shades and have a spicy taste as do the leaves and make a great addition to a green salad. The seed is pickled to make a cheap but tasty pseudo caper. As for the rice, I cook it in a very ad hoc manner taught to me by a friend who was maniacal about the right way to cook it. Very simply I wash the rice several times in cold water, then cover it with two fingers depth of water. Put it on a high heat, reducing this when it starts to boil to furiously and never open the pan lid, except just to quickly check now and again for when the water has been absorbed - if you open the lid too wide you let out the Steam Dragon. It seems like many dishes, rice is better left alone. Once the water has been absorbed and the rice is very slightly al dente remove the pan lid to allow the remaining water to quickly evaporate, leaving the rice 'dry' and fluffy. If you still have water visible above the rice but the grains have already reached this stage, then pour off the excess water first. If you overcook rice it goes sticky, then it is called 'friendly rice', which I think shows just how forgiving cookery can be! Thanks for dropping by and hope to see you again. All the best from an old farmhouse in Normandie by the sea, Sue.